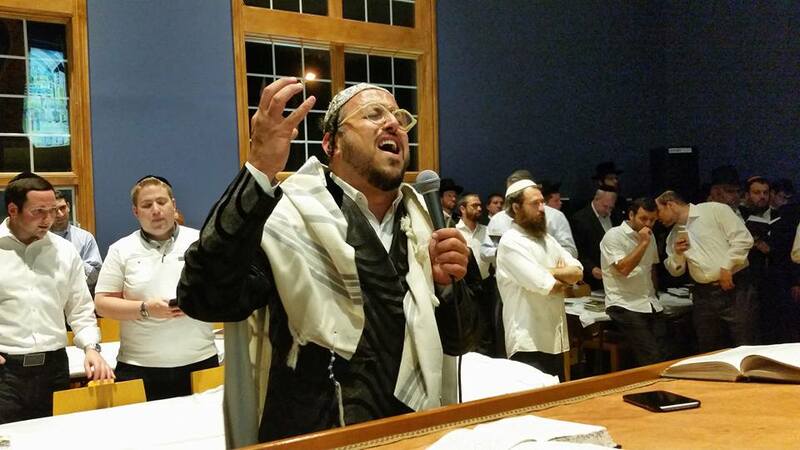 This past Saturday night, I made the drive from Scranton, PA, to Airmont, NY for Selichot led by the colorful hasidic music star Lipa Schmeltzer. 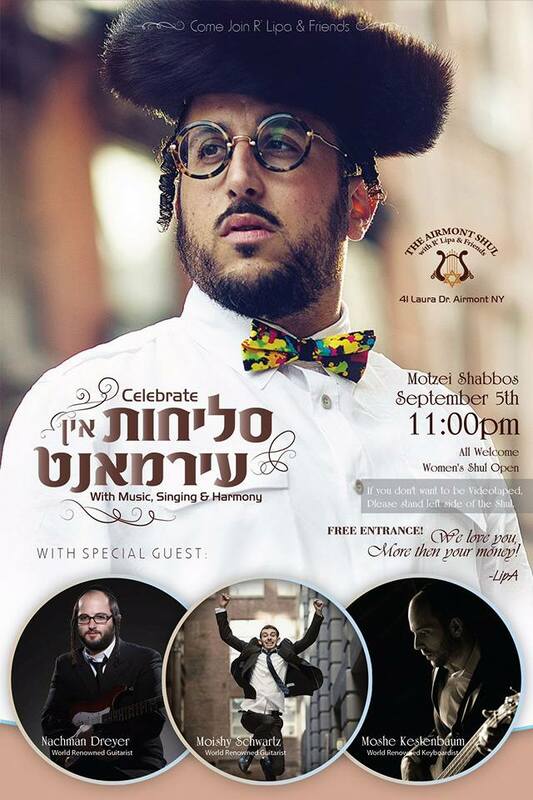 Lipa founded his own shul, The Airmont Shul, in 2008 following his break with the Skvere hasidic community over the contemporary style of his music, his flamboyant personal style, and, later, his secular higher education. The building features a musical motif throughout, including mezuzot cases in the shape of flutes and an ark shaped like a harp. An electric guitar hangs on one wall. An established sensation in the hasidic and yeshivish music worlds for some time, Lipa has recently attained a following in the more modern elements of Orthodoxy, giving concerts at luxury hotels. summer camps and in modern Orthodox synagogues. He is now attending Columbia University for a long awaited BA, something denied him growing up Hasidic. He also gives a twice weekly, widely viewed “Sheni ve Hamishi” words of Torah on Facebook. Most of the time the videos are calls to tolerate, get along, and be kind. Recently, he caused a wave by calling for Hasidic women, from Hungarian dynasties, not to shave their heads as prescribed. Lipa has gotten really good press in recent months – here, here, and here. Despite the professional-quality flyer disseminated on social media and the presence of two guitarists and a keyboardist for accompaniment, Lipa explained that the idea for a large-scale musical service was only conceived several days before. Supporting this assertion was the lack of Selichot books for use in the synagogue. Some people had brought their own, and many others (myself included) quickly downloaded the text to our phones. Still others went without. The crowd numbered about 100 people, mostly yeshivish and hasidic-looking men from the Airmont/Monsey area. Guests came from communities ranging from Scranton, PA, Nassau County and Westchester, NY, and Bergen County, NJ. For the most part, the out-of-town visitors tended to look more Modern Orthodox. The crowd seemed a bit restless at first, talking and shuffling about. Lipa stopped during his opening lines concluding “Ashrei” to ask for silence, and there was a fair amount of “buzz” and cellphone photography/videography throughout. Lipa went fairly quickly through the standard liturgy using a fairly basic nussach (musical motif) for Selichot. The service was really based, however, around several extended singing and dancing breaks, sometimes based around words from the paragraph being read, and other times more free-form. During the periods typically reserved for silent congregational reading, Lipa would lead a song or niggun as well. All the piyyutim were done in record time; many people just listened to his background singing. The music tended towards the upbeat and the Carlebach repertoire, and not his own material. In the beginning, he seemed to be imitating Carlebach’s spirit in style and stories. At one point some words were sung to what sounded like a Billy Joel song and the opening of the Ark in the middle of the service was accompanied by what Lipa said was a waltz that particularly appealed to him and then Avraham Fried’s “Aderaba.” At many points, Lipa would hand the microphone to a friend to lead the singing while he circulated through the synagogue dancing and clapping to generate energy and encourage the dancing. Lipa’s enthusiasm, presence, and showmanship were infectious, and very clearly the lifeblood of the synagogue. One thing that was not sung was the standard Ashamnu. Before the Ashamnu recitation, Lipa explained that the confessional section of the service was exceedingly personal, between each individual and God. He could not offer guidance, as he had throughout, or suggestions to guide our thoughts, so he would just play a “freiliche song” and we could each chose to silently meditate or proceed as we felt appropriate. Lipa founded The Airmont Shul in the wake of a painful and public break from the insular hasidic community he was born into. He referenced the difficult founding of the synagogue and his painful personal journey several times. As the service began, he shared that, for him, the night would be a meditation on not judging others, something he said he still finds himself doing too often, especially in light of how he himself has so often been the subject of judgement by others. College, where he was a student before transferring to Columbia, with the opening of the Ark before the responsive singing of Shema Koleinu, calling him a mentor who helped him immeasurably as he regained his spiritual footing. Despite their ultra-Orthodox dress and look, it was clear that many of his local attendees share similar stories of being judged or being marginal, and that being a part of his congregation was, for some, socially and politically fraught with tension. At the beginning, Lipa asked people who planned to take cellphone pictures or video to only do so in one half the synagogue, and to respect those who expressed their desire to not be photographed by standing on the other side. (He joked, “If someone does appear in a picture, we can always say it was photo-shopped and he wasn’t really here.”) He revisited that theme before the responsive singing of Hashivenu (“Bring us back, O Lord, and we will return”) when he noted the different journeys, both spiritual and physical, that brought his diverse congregation together. 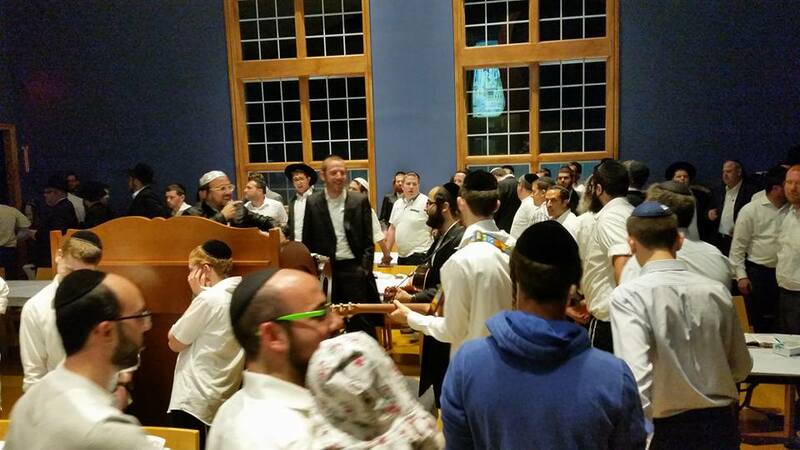 The musical selections towards the end tended to be slower and more contemplative, including a Yossi Green song for Shomer Yisrael and the now-standard Machnisei Rachamim made famous by Avraham Freid. Lipa ended the service with a blast from a shofar before the final kaddish (sung to the Modzitz melody), which led into a post-Selichot round of upbeat dancing. The entire service ran just under two hours, concluding at 1:00am. There was a women’s section, but less than a handful showed up. One women who traveled to be there was disappointed. According to her, the women seemed like they were there to wait for their husbands as displayed by their continuous smartphone use. Also during the second hour of selichos, many men had already gone outside to smoke and socialize. At one point before the end of the service, Lipa remarked how overwhelmed he was by the distance some people traveled to attend, and how everyone who was in attendance from “out of town” would receive a CD before returning home. True to his word, as soon as the last dance ended, he dashed out of the synagogue and returned with a stack of CDs. I received two, including his most recent album “Be Positive!,” featuring hasidic dance and electronic music. In the beginning of the fourteenth century 1300-1306, centering in the southern French region of Languedoc was a renewed round of debate over the role of naturalistic ideas in Judaism. In short, a moderate philosophic rabbi, Abba Mari thought part of the community was too open, too heretical, and too lax in observance. Another moderate philosophic rabbi, Menachem Meiri tolerated the liberal naturalistic positions as part of the open dialogue of the community. Abba Mari draged into the fray the leading rabbi, the “gadol”, Rabbi Avraham Aderet (Rashba) who lived in another country Catalonia, and who was a kabbalist. Rashba issued a local ban and picked on his own local Catalonian philosophic naturalists. In response, the rationalists of Languedoc placed Abba Mari in a ban for denigrating the community and its teachers. They also wrote several sharp defenses of free inquiry, rationality, and philosophy. Two rabbis with similar theological and philosophic positions diverge, one seeking to ban the recent liberal thinkers and the other one thinking they should be tolerated. One of these rabbis was willing to tolerate rabbis who thought that Moses wrote the Torah and that all miracles are to be explained naturalisticly. One of these rabbis was so outraged that he wrote copious letters and missives to let everyone know what he thought was incorrect seeking to curtail the transgressions. A major rabbi bans what he thinks are dangerous positions and no one listens. Major rabbis thinks people should follow the synthesis of the prior century but not engage in new philosophic analysis. 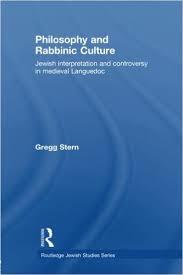 These points are part of what is conventionally called the fourth round of the Maimonidean controversy, which has been well laid out by Gregg Stern Philosophy and Rabbinic Culture (London: Routledge, 2009, pb 2010) Gregg Stern is a Harvard-trained historian of medieval Jewish thought and culture. He is now working on a broader volume, Flashpoints: The Communal Struggle with the Legacy of Maimonides (1188-1340) on the struggles over the Maimonidean legacy. It was published a few years ago, but the paperback just came into the library. The book is a good book to read over the holidays, highly recommended, and it has many long excerpts from the original texts. Heinrich Graetz originally portrayed the Maimonidean controversy as a manifestation of the perpetual danger of philosophy to Judaism, as a much needed corrective H.H. Ben Sasson decades ago showed that the controversies were local specific disputed cultural, religious, and social problems, which were based in the richness and diversity of differing Jewish cultures. The Jewish culture of Southern France was unique in many respects: having traditions that go back to Roman times, being part of Mediterranean religious tolerance, and having a unique method of learning. The classic work was B. Z. Benedict, Merkaz ha-Torah be-Provence (Mosad ha-Rav Kook, 1985). Then, Moshe Halbertal, Between Torah and Wisdom: Rabbi Menachem ha-Meiri and the Maimonidean Halakhists of Provence (Magnes Press, 2000) (Hebrew), showed how these Jews crated a philosophic halakhic synthesis. Halbertal’s analysis sees moderate and radical streams of Jewish society as historical expressions of a profound duality immanent within Maimonidean thought, a typology of two different hermenutical horizons from the same book. Gregg Stern’s book is more step by step, in that, the real-life relationship between the various thinkers and groups within Languedocian Jewish society is, in fact, more contradictory and complex. Stern is also careful, or even insistent, in separating the region of Languedoc from Provence, and both of them are quite dissimilar that Catalonia, similar to the way a careful sociologist may separate the modern Orthodox communities of Riverdale, Teaneck, and Five Towns as each having their own character. Once we mention modern Orthodoxy, another way to get a handle on the micro issues is to know that Jews attended classes at the University of Montpellier in Languedoc in order to become physicians and scientists. Part of the compulsory curriculum and required sections of the medical boards was Averroes’ philosophy, hence the local community was comfortable with philosophy naturalism, even from the pulpit. For more on medieval Provencal life, see the many studies of Joseph Shatzmiller, in this case especially Jews, Medicine, and Medieval Society (Berekeley: 1995). For more on the liberal natural side of these tensions, especially the influence of the extended ibn Tibbon family of translators and pulpit rabbis, see the introduction to my interview with Carlos Fraenkel and the work of James T. Robinson (University of Chicago). The focus of Gregg Stern’s study is the Meiri and specifically the philosophy controversies. In this, he is following his teacher Prof. Isidore Twersky of Harvard, whose Maimonides was a halakhic-philosophic synthesis. Twersky focused much of his research on the well rounded rabbis who were philosophers (hakham hakollel) , and his very doctoral program was itself a potential training grown to produce such rabbis. Using the philosophic controversy as a distant mirror: In 1974, Twersky was appointed to lead a think-tank for Maimonidean ethics at YU, there was no follow-up. 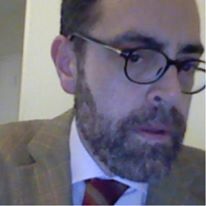 In 1980 or even in 1992, many thought the Maimonidean Rabbi PhD’s that he produced, with their knowledge of Talmud as well as philosophy and history, would be the future leadership of Modern Orthodoxy. They were eclipsed by Rabbi lawyers and rabbi MBA’s. Maimonideanism is no longer popular with modern Orthodoxy and it is not seen as the way of the future. In fact, the ban of the Rashba was positively cited this past June by R. Willig to rein in secular studies. Most indicative of the changes in the community is that this statement seeking to restrict secular studies did not raise any ire, only the issue of women’s learning. One can also see reflections in the current questions of tolerance, or not, for naturalizing revelation and for treating the Bible as an allegory. It is a very long interview, so print it out. Be sure to get down to questions 8 & 9, or better yet buy the book. 2. What was the philosophic goal of the law as taught in 1300, especially by Meiri? Meiri completed Bet ha-Behirah, in 1300. In Bet ha-Behirah, Meiri was in deep sympathy with Maimonides’ goals in Mishneh Torah, of organization and clarification. Meiri described his own halakhic work as a response to Maimonides’ achievements and their limitations. In the Introduction to Bet ha-Behirah, Meiri observed that Maimonides’ code had not been adopted by rabbinic authorities of subsequent generations as the central instrument of study. Therefore, he thought to produce a work—albeit entirely different from Mishneh Torah—that might in its own way provide massive simplification and clarification. Beit ha-Behirah is not a running commentary on the Talmud, although Meiri wrote on each tractate then studied. Meiri records his community’s commitment to philosophy and the sciences as a change in orientation resulting from the 1204 publication of the Hebrew translation (from Arabic by Samuel ibn Tibbon) of The Guide of the Perplexed. In Meiri’s view, Maimonides had enlightened the Jews of Languedoc, and had invited them to integrate Greco-Arabic learning into their curriculum of Torah study; they had done so admirably, without harm to their Talmudic studies. After four or five generations – by Meiri’s day –many of Languedocian Jews had established this broader curriculum as a cultural ideal. Meiri emphasizes the success of Languedocian Talmudists with philosophic study and it has exercised no deleterious effect upon them. Meiri lists and describes these Languedocian Talmudists who inspire him so, such as Rabbis Samuel Shakiel, Gershom of Béziers, and Reuven ben Hayyim. Unfortunately, very little is known about these scholars of whom Meiri is so proud. Meiri envisioned his own culture as a generations’-old community, formed by the great talmudists of Languedoc, together with its elite group of astronomers, mathematicians, physicians, and philosophers; a community that felicitously integrated Jewish and Greco-Arabic learning in the service both of a greater understanding and more profound worship of God and of the glorification of the Jewish people in the eyes of the nations. 3. In the 1300 Languedoc controversy, which is higher- philosophy or halakhah? At the turn of the thirteenth century, there were a range of views regarding the way in which the philosophic tradition and Judaism ultimately ought to be reconciled. Following the path of Samuel ibn Tibbon, there were Jewish scholars inclined to find the teachings of Aristotle and Averroes in the deepest layers of Scripture. Such scholars, for example, increasingly avoided the understanding that Scripture taught the creation of the world out of absolute privation by the will of God. They felt compelled to interpret Scripture naturalistically. Similarly, many of the philosophically informed Jewish scholars had become persuaded that human survival after death is based on the role of the properly developed intellect. Of course, any model of human immortality that solely required philosophic comprehension raised doubts about the precise relationship between observance of the Commandments and his ultimate reward. Other Languedocian Jewish scholars, although philosophically informed, sought out philosophic interpretations of Judaism of a more moderate character. Because of the centrality of Maimonides’ contribution to the synthesis of Judaism with the philosophic tradition, the debate about the character of the synthesis frequently took the form of a debate about the meaning of Maimonidean teaching. A wide range of scholars argued that Maimonidean teaching supported their views, some rather moderate and others quite radical. Abba Mari ben Moses of Montpellier drew heavily on Maimonides’ Guide of the Perplexed and acknowledged it as the authoritative expression of the Torah’s inner philosophic meaning. Abba Mari’s philosophic teachings are nevertheless quite moderate in character. Nevertheless, regarding Maimonides’ interpretation of “The Account of Creation” and “The Account of the Chariot,” as Aristotelian physics and metaphysics, Abba Mari’s Maimonidean allegiance shines through clearly. It is well known to wise men that there are two classes of sciences. The first is the science of nature [physics], which is the science of “The Account of Creation.” The second is the science of divine things [metaphysics], which is “The Account of the Chariot” . . . Without doubt, all of the sciences were known to the scholars of our Torah. . . . On account of our sins, which had multiplied, the wisdom of our scholars was lost—with the loss of our secret books on the esoteric sciences—when we were exiled from our Land… These very teachings are that which is found in the works of speculation written by the sages of Greece. (Abba Mari, Sefer ha-Yareah, Chapter 6, in Abba Mari ed. and comp., Minhat Qena’ot, p. 653). The philosophic positions of Abba Mari and Meiri are extremely close. Meiri’s interpretation of the Talmudic texts that refer to “The Account of Creation” and “The Account of the Chariot” easily demonstrate Meiri’s Maimonidean identification of Judaism’s long-lost esoteric lore with philosophy. Rabbi Avraham Aderet, Rashba held that the Maimonidean identification of Jewish esoteric teaching with philosophy was fundamentally incorrect and deeply misguided. Rashba argued that physics and metaphysics were a noxious and basically valueless Greco-Arabic intrusion upon the Jewish tradition, with which it was incompatible. Rashba wrote that the great Torah scholars of Languedoc initially were ignorant of Arabic philosophy. Once this new learning arrived, he continued, they falsely identified it with the esoteric teaching of the Torah. Rashba’s own understanding of “The Account of the Chariot” may be confirmed in his little-known “Responsum to the Scholars of Provence” in Seder Rav ‘Amram Ga’on, ed. 1912, (39b–40b). In the responsum, Rashba informs us that “The Account of the Chariot” is none other than “the [kabbalistic] things that are hinted at by the commandments of the Torah.” Indeed, one cannot achieve the commandments’ goals by any means other than their performance.. As Rashba would have it, the “Supreme Chariot,” far beyond the grasp of the gentile philosophers, is none other than the ten sefirot. The Jewish scholars of Languedoc viewed Rashba as an unsympathetic outsider to their interpretive disputes. In fact, Meiri argued that Rashba’s involvement not only would be considered an intrusion, it should be considered irrelevant. Meiri maintains that, as a kabbalist and adversary of philosophy, Rashba may not meaningfully express an opinion regarding the disputes then going on in Languedoc regarding philosophic study and interpretation. Although our master the Rabbi [Rashba] is a father to us all, and no one would raise a twig or open his mouth and chirp against the perfection of his rank, you are well aware that in these [metaphysical] matters there are a variety of opinions. [Rashba and his school] have chosen as their lot the science of the Kabbalah. In their view, most of the discussions of philosophy are a demon, a she-demon, and injurious angels” (Meiri, as quoted in a letter by Simeon ben Joseph, Hoshen Mishpat, ed. David Kaufmann [Berlin: 1884] Hebrew 150–1). Upon becoming better acquainted with Provençal Jewry, however, Rosh was astounded at their religious orientation. He entered their “hearts” expecting to find the “chambers white” with the pure spiritual devotion that he knew from Ashkenaz. Instead, he encountered an unfamiliar philosophic orientation that he could only describe as “black” (Rosh, Minhat Qena’ot, p. 596). 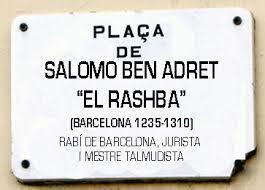 In the fall of 1304, Rashba was hosting Rosh in Barcelona. Rosh would eventually conclude his journey in Toledo, the capital of Castile, where he would head its Jewish community. While in Barcelona, Rosh declared that he could not support Abba Mari’s position that scientific and philosophic study should be prohibited before the age of twenty-five, because such support would imply, incorrectly, that philosophic study was permitted once one had achieved that age. When settled in Castile, Rosh expressed the view to Abba Mari that philosophic study is entirely prohibited “in our days” (Rosh, Minhat Qena’ot, p. 835). 4. What are the limits to philosophy allegory? In Judaism, as in Christianity, the allegorical interpretation of Scripture was integral to achieving an accommodation with scientific and philosophic learning. Indeed, the ubiquitous nature of allegorical exegesis, of all types, among both Christians and Jews during the High Middle Ages was conducive to such an accommodation. Meiri, for example, interprets the biblical story of the building of a tower to the heavens—which God and His Court frustrated—as a trope for the tower builders’ arrogant denial of things divine. For Meiri, the very idea of the existence of a tower, stairway, or fortress that reached the heavens—and God—was absurd. [The meaning of the tower, on the contrary,] is that this generation could not comprehend things in the heavens and above them. They could not see ‘the Lord standing [at the top].’ Instead, they denied His existence, may He be praised, and the existence of incorporeal intelligences” (Meiri, ’Avot, , 3: 11, 132). In Meiri’s first textual category, elements of biblical narrative that present philosophic problems, are given exclusively figurative interpretations. One such group of narrative elements are references to God’s body. It is known that God has no body, as a body would imply in Him multiplicity and imperfection. Meiri’s second category is the inverse of his first: biblical texts that must be interpreted literally. In the second category, texts are protected from allegorical interpretation Meiri prohibits the allegorical interpretation of texts such as those that had been the subject of the problematic sermons in Languedoc. The Creation story, like the prohibition of murder, is not to sacrifice its literal meaning; miracles are to be understood as they were related. Meiri also makes an analogy between the minor details of commandments and the minor details of narrative. Meiri claimed that it is similarly futile to assign allegorical meaning to narrative details that could not help but be related: once Eliphaz’s concubine’s name was given, for example, she could not have a different one. Meiri’s third category strives to distinguish between interpretation that replaces the literal meaning of a commandment and interpretation that deepens it. In his third category, interpretation sustains the literal meaning and adds a new, hidden meaning. Meiri mentions two examples: The prohibition of shaving, he explains, may be intended to prevent a practice which could lead to idolatry. Rest on the Sabbath inculcates the doctrine of creatio ex nihilo, which in turn allows for the possibility that the world’s laws might be temporarily altered by their Founder. In regard to both examples, Meiri explains, the interpretation of the commandment does not obviate its literal observance; in fact, it may enhance it. Meiri therefore hoped to steer the radical allegorists in his community away from those texts where the dangers excessive naturalism were most significant. Meiri does not appear overly concerned as to remove allegorical interpretation from public sermons altogether. In addition, Meiri would enforce the prohibition against public exposition of the Torah’s “Secrets”—the allegorical interpretation of those texts that both Meiri and the preachers held to contain statements of Judaism’s esoteric lore. Meiri says that he would give Abba Mari his full support to pursue such a plan. Meiri himself directed his substantial allegorical interests and intuitions toward Proverbs and Psalms, but refrained from any such activity in regard to the Torah and Prophets. In regard to the philosophic interpretation of aggadah, Meiri restrained himself along similar lines. Meiri comments laconically, “These Talmudic aggadot contain many esoteric statements concerning the ‘Account of Creation’ and the ‘Account of the Chariot’ which it is not within the bounds of this work to explain” (Meiri, Bet ha-Behirah, Hagigah, 2: 1 [p. 28]). 5. What got Abba Mari upset enough to go to Rashba? In Abba Mari’s vision, the study of science and philosophy in Languedoc should be restricted to the community’s senior members, drying up the stream of scientific translation and innovative commentary that the Tibbons had inspired. He interpreted the biblical verse “Incline your ear and listen to the words of the philosophers but let your heart follow my position” to grant the pious student permission to engage in philosophic study, but he restricted the verse’s application to “great scholars” (Sefer haYareah, Ch. 14, Minhat Qena’ot, 659). Abba Mari’s consternation over both the broad accessibility of philosophic learning among Languedocian Jews and that community’s increasingly widespread discussion of the philosophic meaning of Jewish tradition provides the germ of the controversy. Abba Mari esteemed philosophy as the very pinnacle of the Jewish tradition and felt it critical to enforce the Maimonidean injunction to restrict philosophic study to the qualified elite. He hoped that the Jewish scholars of Languedoc would censure those who, in his view, had overly popularized the philosophic tradition in their community. The ways in which the generations of students following Samuel ibn Tibbon sought to widen the scope of allegorical interpretation seemed to Abba Mari to endanger the historicity of biblical narrative and, at times, even threaten the literal meaning of the commandments. In Languedoc, Aristotle’s writings were not studied directly, but only as they were found embedded in Averroes’ Commentaries. Translated in large part by Samuel ibn Tibbon’s son Moses in the mid-thirteenth century, Averroes’s Commentaries on the Aristotelian corpus were among the most sophisticated philosophic works in circulation at the dawn of the fourteenth century. The devotion of a certain group of Languedocian scholars to Averroes’s Commentaries inspired their reckless interpretations. At times, Abba Mari reports of “just two or three [persons]” (ibid.) who require censure, but at other times he stands aghast at the troubling and dangerous philosophic interpretations that a small group of “youths” share publicly in the synagogue. Abba Mari’s description of the suspect teachings is limited to a few slogans: Abraham and Sarah are figurae for form and matter; the four matriarchs indicate the four elements; Jacob’s twelve sons represent the signs of the zodiac; and the Urim and Thummim may be understood as an astrolab. Abba Mari feared that the Christian-like reading of the Commandments endangered religious observance, and their public discussion of the Torah’s inner philosophic meaning violated Talmudic law. Among the Jewish scholars of his own community, Abba Mari failed to achieve sufficient support for his views for any definitive public action. This situation did not dissuade Abba Mari from his mission, however; rather, it appears to have strengthened his resolve to secure the intervention of a powerful authority. 6. Why was Rashba less than involved at first and then later why did he issue a ban? Rashba wanted to help Abba Mari, nevertheless, he understood that were he to have taken up Abba Mari’s request to condemn the interpretive transgressions of Languedocian Jewry, a fruitless intercommunal estrangement would have ensued. The Catalonian scholar therefore asserted publicly that, while Abba Mari’s intentions pleased him, he had no authority to intervene in the affairs of the Jews of Languedoc. Rashba, instead, encouraged Abba Mari to find like-minded Languedocian scholars who would take his concerns to heart. Rashba felt that God would give them the resolve to pursue the honor of the Torah, like “the great holy remnant that was formerly in their land” (ibid). “The great holy remnant” may refer to the kabbalists of early thirteenth-century Languedoc, such as Isaac the Blind. Rashba’s knowledge of the Jewish allegorical interpretation then current in Languedoc derived exclusively from oral reports of individuals from Barcelona, frequently Rashba’s former students, who had occasion to travel to Languedoc. A horrifying variety of reification allegory, which discarded the literal surface meaning of Scripture, is what Rashba heard told was being promulgated in Languedoc. They inscribe wicked inscriptions in their books and fill their homes with empty vessels saying: Every narrative from Creation to Revelation has an exclusively allegorical meaning. Abraham and Sarah are Form and Matter, the twelve sons of Jacob are the twelve constellations, and the four kings who battled the five kings are the four elements and the five senses. We have heard that they even extended their hands against the Commandments [through allegory] saying: the Urim and Thummim are the mechanism of the astrolabe. They have rendered the phylacteries and prayer unimportant. They have not feared to speak against Moses himself saying, heaven forbid, that [the Torah] is a nomos; saying the Torah is not from heaven, rather norms and customs that Moses decreed (Minhat Qena’ot, p. 734). Rashba’s informants delivered news from Languedoc of the teaching of a naturalistic understanding of Moses’ prophecy, according to which Moses himself founded and authored the Law, which did not come directly and without mediation from God. The same Languedocian interpreters, Rashba’s informants say, likewise understood many Commandments to have an exclusively utilitarian function, such that one might easily question their continued validity and perhaps even reject them. One of them said: the intention of the phylacteries is not literally to wear them on the head and arm, because the intention of this commandment is solely to understand and remember the Lord. [This is the case] because the legislated place of the phylacteries—the head apposite the brain and the arm apposite the heart—as they are the instruments of understanding and memory—to intimate that one ought to understand and remember, and nothing more. . . “ (Minhat Qena’ot, p. 735). 7. Who was Levi and why was he hounded? Levi ben Abraham ben Hayyim of Villefranche-de-Conflent is the author of a voluminous encyclopedia of science, philosophy, and Jewish interpretation, Livyat Hen (1295). Levi was a pious but vulnerable itinerant teacher of philosophy. At the time of the controversy, Levi had found residence in the home of Samuel L’Escaleta, a wealthy Narbonnese moneylender and philosophically oriented Talmudist. Based upon oral reports, Rashba chose to make an example of Levi, yet Rashba never saw any of Levi’s writing. Rashba condemns Levi’s exegesis in the harshest of terms. In fact, Rashba was convinced that Levi was the leader of a Languedocian Jewish group who repudiated the historicity of the biblical narrative, the possibility of miracles, and the very existence of revelation from God. Rashba’s hyperbolic description of Levi’s work and leadership is more a statement of how Rashba felt about Jewish philosophic interpretation in Languedoc than an accurate description of anything that Levi actually had written or taught. Crescas Vidal, Rashba’s student, testified publicly to Levi’s probity and piety. Apparently insufficiently impressed by the assurances of his student Crescas, Rashba continued to condemn Levi and to seek his removal from the home of Samuel L’Escaleta. As Rashba had no further response from Crescas, he turned to Samuel L’Escaleta directly. In an especially moving and forceful letter, Rashba expresses his affection and admiration for Samuel and urges him to abandon philosophic study and to expel Levi from his home. In his excommunication of the Languedocian allegorists, Rashba cites an interpretation of Levi’s — which, indeed, is also found in Livyat Hen— regarding the ancient Rabbis’ statement, “the mem and samekh in Moses’ tablets floated miraculously in stone” without external support. Levi writes that these two square letters must have been suspended in the tablets by some hidden support mechanism. Intriguingly, this interpretation impresses one as rather typically Maimonidean, and not particularly dangerous or potentially harmful. Instead, Rashba draws the dubious conclusion that Levi’s desire to provide an interpretation that obviates the need for a miraculous suspension of these letters constitutes an implicit rejection of all miracles on philosophic grounds. All Israel is required to excommunicate these sinners. Until their death, they shall not atone for this transgression. The fire of Gehinom will be extinguished, but the bodies of these [sinners] will not be consumed. Upon [their bodies] the flame will go never go out . . . Regarding the books that any one of those among them wrote, we judge its owner a heretic and the books as the books of the magicians. They and anyone who owns them stand in excommunication until they burn them completely and no longer mention their name [contents]. Following the commandment of the Torah regarding the statues of their gods, to burn with fire and erase their name [memory]. But one who repents and regrets will receive mercy from heaven. . . .(Rashba, Minhat Qena’ot, p.737). If Rashba’s fiery condemnation was, in fact, ever received, Languedoc completely ignored it. No acknowledgement, of any kind, to this international condemnation of transgressive philosophic allegory exists. In the extensive correspondence following the excommunications, the scholars of Catalonia made no mention of this world-wide condemnation either. Perhaps Rashba’s condemnation was perceived as such an utter blunder that all those involved, including the Catalonian scholars, thought it better to conduct themselves as if it simply did not exist. Rashba himself certainly never took up the issue again. 8. What was the reaction to the ban? Reaction in Languedoc and Catalonia to Rashba’s grand prohibition of philosophic and scientific study in Barcelona before the age of twenty five is complex and requires some explanation. Abba Mari failed to overcome local opposition to a prohibition on philosophic study in Languedoc — despite Rashba’s extraordinary support. In fact, the Jewish scholars of Languedoc never complied with Rashba’s urgent request that his decree prohibiting the study of physics and metaphysics. Immediately following the pronouncements in Barcelona, Rashba found it necessary to issue several written demands for the fulfillment of Abba Mari’s promise to support the ban. In an especially urgent short note to Kalonymus ben Todros, the Nasi of Narbonne, Rashba wrote that he would send copies of the excommunication documents signed in Barcelona only when he received the promised formal Languedocian approval of the excommunication from Kalonymus. Quite to the contrary, Languedocian scholars were outraged that the Catalonian scholars had presumed to instruct them. As word of the Barcelona decree reached Montpellier, the leading scholars of the city acted expeditiously to counter any potential effect of the Barcelona decree in Languedoc: they obtained the necessary permission from the representative of the King of France and excommunicated Abba Mari. Despite Abba Mari’s best efforts, the scholars of Montpellier pronounced a ban upon anyone who would prevent any pupil, regardless of age, from the study of philosophy. Abba Mari was now under excommunication and could have no contact of any type with those under the sway of the Montpellier scholars. The astronomer and poet Yedayah ha- Penini was most disturbed that Rashba had actually sent letters throughout Aragon, Castile, and Navarre to solicit support for his recommendations in Languedoc, thus tarnishing the reputation of Languedocian Jewry internationally. The Montpellier scholars equated Rashba’s ban on non-Jewish philosophic works with previous attacks upon the works of Maimonides. In the view of Abba Mari’s adversaries in Montpellier, no distinction could be made between a ban on the study of physics and metaphysics and a ban on the study of The Guide of the Perplexed. Meiri publicly entered the controversy at the point of the excommunication and counter-excommunication in Montpellier and established his own position among the controversy’s leading figures. As Meiri was the greatest living Talmudist in Languedoc, it would have been natural for Abba Mari to seek his opinion and guidance. Since Abba Mari never publicly sought out Meiri’s opinion, we can only guess that he must have known that he would not find it welcome. As we have seen, Meiri respected Rashba greatly as a Talmudist, but was convinced that as a kabbalist, Rashba had no role in the controversy between Maimonideans. When Meiri finally wrote publicly regarding the controversy, Abba Mari attempted to suppress this letter. Even after the letter was leaked to the public through unknown sources, Abba Mari failed to respond to its charges. Instead, Abba Mari asked a member of his inner circle, Simeon ben Joseph, to pen a public, line-by-line response to Meiri. Abba Mari did not include Meiri’s letter or Simeon’s response in Minhat Qena’ot. Meiri viewed Abba Mari’s call to Barcelona as contributing not only to the slander of prominent Languedocian Jewish scholars, but also to the defamation of their generations-old cultural ideal of commitment to traditional Jewish and Greco-Arabic learning. Meiri tried to appeal to Abba Mari to recognize the community of philosophically educated Jews as God-fearing. Meiri upheld the stature of the tradition of Languedocian philosophic translators, encyclopedists, and philosophic exegetes that began with Samuel ibn Tibbon, and insisted that their sometimes-radical works should be accepted and studied. Meiri’s positions on fundamental issues differed significantly from those of Samuel ibn Tibbon and other Languedocian Jewish scholars who took up his project of the Hebrew translation of Arabic philosophy and the philosophic interpretation of Scripture. Yet, Meiri went to great lengths to deflect any suspicion that their teachings represented a philosophically sophisticated heresy. He argued that scientific works by these esteemed Languedocian Jewish scholars should be judged as a whole, while any apparently problematic individual teaching should not be overly scrutinized. If, upon occasion, I discover in some work something that, perhaps, is in need of correction, I attribute this to the weakness of my intellect, and I set it aside for one who knows more than myself… I will not abandon a book full of several gems on account of one, two, or three questionable items… We recall the Talmudic statement [concerning the canonization of the theologically problematic book of Ecclesiastes, “Yet why did they not hide it?”] “Because its beginning and end are Torah teachings” (Meiri, in Simeon ben Joseph, “Hoshen Mishpat,” pp. 157-8). Meiri used the metaphor that the books of the Tibbons “are full of thorns,” but with careful reading it was possible “to pick the rose.” Meiri justified the preservation of books with troubling passages written by Languedocian philosopher-translators with an analogy to the rabbis’ preservation of the frequently troubling book of Ecclesiastes. Although Meiri held similar positions to Abba Mari regarding the deepest philosophic questions and was aware of the danger posed to traditional views by inappropriate exposure to philosophy, he believed that the Languedocian enlightened Jewish community that the Torah itself required was dependent upon the clear accessibility of distinguished philosophic achievement. 9. How did Meiri and Yedayah ha-Penini issue decrees on the necessity of philosophy? As a public statement to the Jews of Languedoc and Catalonia, Meiri’s letter to Abba Mari, were it summarized in our own language, conveys roughly the following message. Greco-Arabic learning is no longer foreign material that might be banned; it is part of Jewish culture. There are Jewish tracts on the sciences, and the sciences have been incorporated into non-philosophic works as well. The sciences are necessary in order to approach the central book on the meaning of Jewish tradition, Guide of the Perplexed. Let us not go back to the days when the validity of the Maimonidean legacy was in dispute! Rashba is a kabbalist, and his commitments make him ill-disposed to ours. Despite his universal authority on legal matters, his anti-rationalism takes him out of our realm of discourse, and renders his opinion concerning the course of Languedocian Jewish culture of little relevance. The religious problems raised by philosophic study are inconsiderable in relation to its benefits. Our distinguished specialists in the sciences should be allowed to pursue their work unhindered, and their writings—however troubling—should not be suspected of heresy. To restrict access to the sciences—even from a few people for a short time—would almost certainly be to their detriment and the detriment of our community. Experience has shown that excommunications do no good. Let us put them all away, and allow each group within Languedoc to act as it sees fit. Concerning the incorporation of the Greco-Arabic legacy within Languedocian-Jewish culture and the impropriety of any attempt to reverse it, the community’s leading halakhist was unequivocal. Meiri cited the failure of the early 13th-century attacks against Maimonides. Rejecting insinuations that the study of philosophy causes heresy, he pointed to many talmudic scholars who were students of philosophy. He regarded the prohibition against certain types of study as self-defeating: “Each individual [nature] will search for what suits him according to his natural inclination.” This trait of human intellect and nature, he maintains, will even cause the second generation of the excommunicating community to seek ways out of this prohibition. The Ketav ha-Hitnatzlut of Yedayah ha-Penini, who will later become an important astronomer, mathematician and poet was the only Languedocian letter regarding the controversy to be included in Rashba’s anthology, Yedayah’s letter has the air of the Languedocian community’s official reply. Yedayah concluded his letter to Rashba with a plea for the Catalonian leader to revoke his prohibition on the study in Barcelona of physics and metaphysics before the age of twenty five. Even if Joshua ben Nun were to command them [to abandon philosophy], they would not obey; for they intend to do battle for the honor of the great Rabbi [Maimonides] and his books. So long as life’s breath is in their nostrils, they will sacrifice their wealth, their offspring, and their very lives for the sanctification of his teaching; and in this manner shall they instruct their children throughout the generations” (Yedayah ben Abraham Bedersi [ha-Penini], “Ketav ha-Hitnatzlut,” in Shut ha-Rashba,, 1: 418, p. 174a). In Yedayah’s view, one simply cannot not separate the Greco-Arabic philosophic tradition from the Maimonidean legacy. The Jews of Languedoc therefore would hold fast to the various scientific and philosophic disciplines with their very lives. No grand excommunication from an outside authority could dissuade them. Thus, Rashba had placed Languedocian Jews’ profound respect for him at odds with their most fundamental commitments. Yedaya therefore advised Rashba to withdraw the ban (which he did not do). 10. What was Twersky’s view of the role of philosophy in Judaism, or Maimonidean Judaism? Isadore Twersky identified deeply with Maimonides. Therefore, it is difficult to distinguish Twersky’s own view of Judaism from his understanding of Maimonides’ view. According to Maimonides, philosophy was transmitted by Jews in Antiquity as esoteric Torah teaching (Guide I:71). Physics could be taught only in small groups, and Metaphysics could only be taught one-on-one, and in hints (Mishnah Commentary, Hagigah 3:1). In his Code of Law, Maimonides placed philosophy at the pinnacle of the curriculum of Torah Study, as follows (MT Hilkhot Talmud Torah 3: 11-12): He requires that one begin with 1) Scripture, and then to advance to 2) the Oral Law – Mishnah, Tosefta, Mekhilta, Sifra, Sifre, Bavli, Yerushalmi, etcetera — and finally to proceed to 3) exegetical theory (which Maimonides distinctively terms “Talmud”). Within this curricular hierarchy, Maimonides explains, one first masters Scripture and then, the Oral Law, at which time one is free to devote himself exclusively to understanding. Maimonides rules, at the conclusion of this exposition, that Pardes (philosophy) is part of Talmud. In Maimonides’ — and Twersky’s — vision, therefore, the entire curriculum of Torah study supports and leads to the study of philosophy. 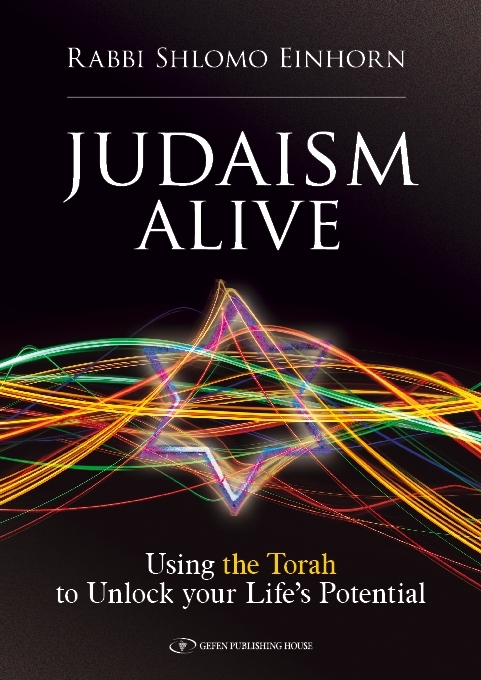 For Maimonides, as for Twersky, Judaism is an instrument that leads the individual Jew and the Jewish community to lofty moral, intellectual and spiritual goals. Yet, Professor Twersky would smile as he pronounced the provocation, “Maimonides’ was a failure”. He intended this pronouncement as a test of his students’ understanding as to how the greatest figure in Jewish intellectual history – profound and innovative halakhist, daring and penetrating philosopher, elite physician and renowned community leader might be considered a failure. The sense in which Maimonides was a failure was, of course, that Jewish history saw fit to reject his placement of philosophic spirituality at the center of Judaism. 11. How did Meiri view Christians and Christianity? In the writings of Languedocian Jewish scholars in the generations preceding Meiri, one discerns the notion of “religion” as belief in a creating, overseeing, and recompensing Deity who cannot be known through reason. Meiri styles those who are committed to an incorporeal Deity and believe in His reward and punishment as people “bound by the ways of religion.” Religion, in Meiri’s post-Maimonidean, Languedocian understanding, not only provides the beliefs necessary for human perfection, but also constitutes the social order, in that its teachings underwrite the law-bound behaviors and practices that are integral to civilization.